HONG KONG, Apr 26, 2018 - (ACN Newswire) - Registration is now open for one of Asia's most in-depth events for start-ups, the inaugural and J.A.D.E Start-Up Conference - "Scaling Resilient Entrepreneurship", organized by the Joint Association to Develop Entrepreneurship (J.A.D.E). The event, to take place in Hong Kong on 15 May 2018, will feature a number of sharing sessions by exceptional speakers and valuable networking sessions. The J.A.D.E Start-Up Conference will assemble around 180 entrepreneurs, mentors, incubators, and venture capitalists from Hong Kong and Silicon Valley to share inspirational ideas. Apart from insightful talks by Silicon Valley serial entrepreneurs and investors on product-market fit, and lean start-up methodology to scaling globally, J.A.D.E is practically focused on growing start-ups beyond incubation and seed-stage into revenue-generating firms. The event will also offer an exceptional opportunity for start-ups and entrepreneurs in town to connect with international investors and peers to grow their networks. "We are glad to host this inaugural and unconventional event in Hong Kong, sponsored by Black Tiger Capital, Cooley, and Deloitte. J.A.D.E is an excellent platform for founders and investors from Silicon Valley and the region to mingle and catalyze the Hong Kong entrepreneurship ecosystem. We will work with young innovators to further sharpen their product and business sense from the viewpoints of customers, investors, marketers, and technologists in order to be as viable as possible. 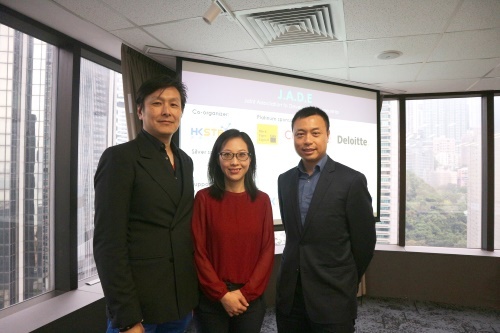 J.A.D.E is the place to be for scaling early start-ups beyond incubation and seeding to attract future capital," commented Ms. Wendy Kok, Founder and CEO of J.A.D.E. For registration, please visit: https://jade-conference-2018.eventbrite.hk. J.A.D.E is a platform to facilitate experience, knowledge, networking, and technology exchange for the perpetual growth of the entrepreneur ecosystem. The association aims to build up the Hong Kong start-up ecosystem by elevating innovators and investors through cross-pollination with Silicon Valley practical experience and networking to re-ignite Hong Kong innovators' entrepreneurial spirit to bridge the unmet local and global innovation gaps. For details, please visit: https://the-jade.org.